Photo by Jessica Campbell. 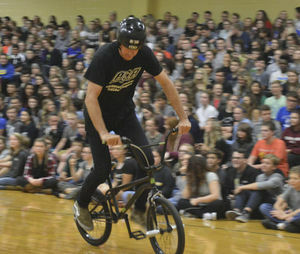 An ASA Entertainment rider performs tricks to show the students at New Prairie High School on Thursday. The riders came to the school for an anti-bullying event. New Prairie High School students high-five the biker during the anti-bullying event on Thursday. La PORTE — A group of men travel the country as professional skateboarders, bikers and BMX riders. They set up ramps, show off their skills, but most importantly, spread a message to the crowd. No more bullying in schools — a message made to the students of New Prairie High School on Thursday afternoon. The group is ASA Entertainment traveling around on the ASA High School Tour, supporting the Anti-Defamation League’s No Place for Hate campaign and the campaign for Tobacco-Free Kids. 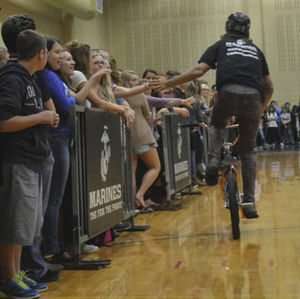 The tour uses five of the top professional riders from the X Games to perform tricks and skills, while a speaker walks around the event area delivering an educational message for the students. Tyler Hank is the Tour Manager of the group, which started around the year 2000. In the beginning years, he said, the tour would preach specifically on no tobacco in schools, but then principals and superintendents were telling them tobacco was not a major concern inside the building. So, the tour connected with the No Place to Hate campaign and has been delivering messages against personal and cyber bullying to students, elementary to high school age, all over the country. In every school, Hank said, the event gets awesome feedback and excitement. “Schools love the assembly,” Hank said, after receiving feedback from the educators. The riders were forced inside for their first time visiting a school in La Porte County, but the walls and crowded bleachers did not hinder their performance. The event is free to every school and is paid for by the U.S Marines. The group consists of one skateboarder, three BMX riders and one inline skater who all perform on a big half-pipe. For their performance inside, they chose a smaller map. One rider, Eito Yasutoko, from Japan, joined the tour after winning several years at the World Championship X Games. “I like these tours because of the positive message to the kids,” Yasutoko said. Other riders come from all over the world, including England and Chile. It is a good message to spread, Hank said. The tour’s website was forwarded to NPHS Principal Justin Holmquest, who thought it would be something the students would enjoy and appreciated the message of anti-bullying and acceptance. Holmquest said he would encourage other area schools to reach out the group for their own school performance. Afterward, the riders stayed to talk and take pictures with the students.